The details really matter when you think of dining as an experience, and that includes the type of drinks you recommend or serve alongside your restaurant's desserts. An effective drink pairing can complement the flavor profiles of your after-dinner indulgences and cultivate a memorable experience that will earn your patrons' trust, and their repeat business. This year, online pastry program students should explore the magic that is an effective drink and dessert pairings. Berries and Champagne just go together, so it's only natural that a baked berry tart would be the perfect companion for a Champagne or sparkling wine. A Spanish Cava or Italian Prosecco is also a strong complement for fruit-based desserts. The bright, crisp, bubbly and semi-sweet qualities of these drinks pair perfectly with the likes of a rustic three-berry tart, such as this simple recipe from Fine Cooking. The result is a dessert experience that is at once wholesome and refined. A white or tawny Portugal port paired with a creamy creme brulee is opposite in spirit to the Champagne and tart experience, but no less memorable. White ports in particular have been making somewhat of a comeback in recent years, according to Food52, and they have an edge in their versatility as a pairing partner. In addition to custards such as creme brulee and lemon meringue pie, white ports pair nicely with angel cake and white chocolate-covered strawberries, according to Wine Folly. Another drink that probably doesn't get enough credit as a dessert pairing option is a good old-fashioned glass of Kentucky bourbon served neat. An example of the perfect dessert companion is sweet potato cornbread pudding, which combines creamy and crunchy textures for an unrivaled southern-style custard. In fact, this recipe and pairing come from a chef based in Louisville, a prominent stop along the well-known Bourbon Trail, according to Bake from Scratch. Whiskey sales are up in the U.S., and bourbon is especially popular among millennials, according to CNBC. Other desserts that go well with a bourbon include pumpkin pie, sticky toffee pudding and nearly any type of bread pudding. There are countless ways to pair coffees and teas with dessert menu items. Coffee is much more than a tasty jolt of energy in the morning. It's also a prime candidate for a versatile array of dessert pairings. For example, you could go with a classic molten chocolate cake combined with an Irish coffee, as recommended by Sweet Street. Another intriguing albeit more audacious pairing, courtesy of Sift, is a triple espresso martini on the side of a white-chocolate mousse filled cake, topped with cream cheese cookies 'n cream frosting. If you're more a purist, there's a classic type of coffee to pair with nearly every baked good under the sun – cappuccino with ice cream, a latte with cookies, espresso with French macarons, or a fresh-brewed cup of black coffee with a shortbread or flan. Compared to coffee, tea is somewhat of a newcomer on the dessert scene, but it has proliferated. 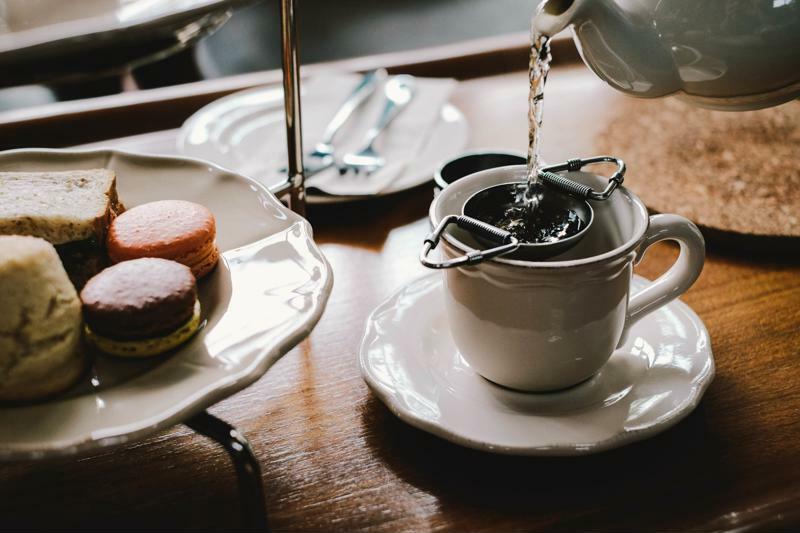 From green-tea flavored Kit Kats and ice cream to chai coffee cake, there's no shortage of creative applications of tea in dessert. When it comes to pairings, teas are surprisingly versatile. A hot and creamy chai tea might go well with a dessert crepe or scones. Earl Gray's bergamot flavor makes it the perfect complement for citrus desserts such as lemon cake and tarts. Black teas pair nicely with richer dishes such as cheesecake or devil's food cake. But don't just take our word for it. Give it a shot, and keep experimenting in search of new and innovative drink and dessert pairings.